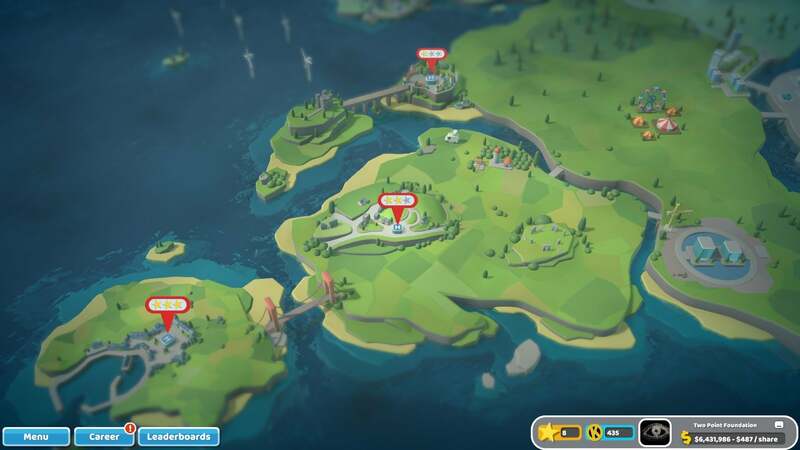 Dumb dad jokes wedded to an excellent management sim and builder game, Two Point Hospital is the rare spiritual successor that manages to not just honor its past but surpass it. Then the call comes over the PA. “There’s been an accident, and we’re the nearest hospital. They’re asking if we can take an influx of clowns. Nurse Barney McBoatface, please report to the Dehumorfier immediately!” I’d watch that show. Twenty years ago, Bullfrog put out a little game called Theme Hospital. As I wrote a few months ago, Theme Hospital was “a simulator from that era in the ‘90s where seemingly everything was primed for simulation.” Even something as dreary as healthcare. 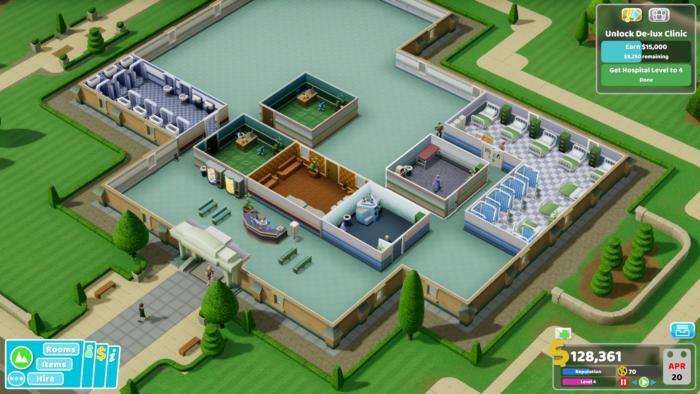 Theme Hospital was more a pseudo-simulation though. It wasn’t a game about curing cancer or staving off an influenza epidemic—and good thing, too. Chances are if you’re in a hospital normally, it’s one of the worst days of your life. Not really appropriate material for a video game adaptation. But Bullfrog borrowed the mechanics of hospitals without the realities, cursing its patients with irreverent diseases like Uncommon Cold and Kidney Beans. It worked, and two decades later Theme Hospital is still considered an all-time classic, even appearing in EA’s On-the-House program. Two Point Hospital is a faithful successor, one that’s content to mostly take the same ideas and update them for modern hardware. And why not? With members of the original Theme Hospital team working on Two Point Hospital, it might as well fall to them to make a sequel. 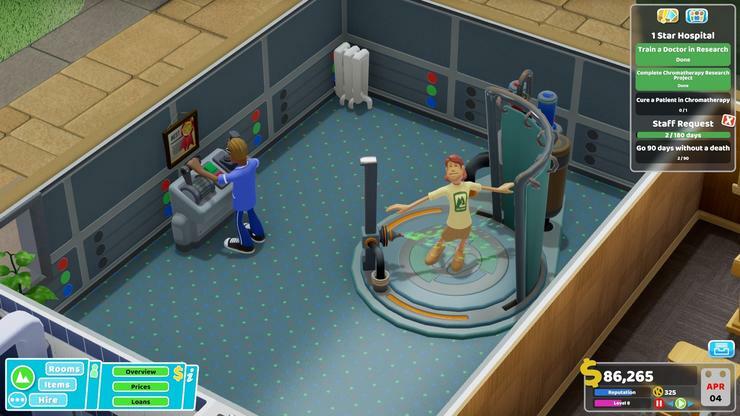 The diseases are different, the interface more advanced and streamlined, but Two Point Hospital will feel familiar to any Theme Hospital veteran. It has the same wry sense of humor, one that’s consistently elicited laughs from me. If you’re a fan of dry sarcasm and bad puns (and I am) then Two Point Hospital is a joy. A personal favorite is “Monobrow,” a disease that manifests as you’d expect, giving the patient a single long and hairy eyebrow. There are additional layers though. Monobrow is contracted by, and I quote, “excessive consumption of both highbrow and lowbrow entertainment.” And when it’s cured? There’s a chance the monobrow escapes, turning into a monobeast and roaming the hospital until you spot and “shoot” it with the mouse cursor. Joke upon joke upon joke. There’s the visual humor, the wordplay, the surreal absurdism of an eyebrow wriggling around the hospital like a worm, the fourth-wall breakage that comes from the mouse cursor transforming into a crosshair. Two Point Hospital is one of the most consistently hilarious games of 2018, rich with surprises. It rewards observation—pausing your relentless building efforts to take a look at your patients, or just appreciate the silliness of its procedurally generated names. The radio DJ is another high point worth mentioning, his spoken interludes particularly surreal when you’re playing at 3 a.m. “It must be weird for you to hear this voice every few minutes,” he says. Yes, yes it is. Anyway, the bulk of your time is spent building up hospitals to cure a procession of ridiculous diseases. Notice I said hospitals, plural. I’ll admit, I haven’t finished Two Point Hospital yet, but I’m eight hospitals in, and I’ve no idea how many there are. At least fifteen, judging by the Steam achievements. Yes, fifteen. It feels a bit hectic, honestly. Two Point Hospital isn’t a singular place—more of a healthcare empire. Starting from a small, one-building clinic in the suburbs, soon you’re laying out enormous, eight-building facilities in esteemed castle-like universities and so on. Each level introduces new ideas and constraints. Early on that’s usually a disease or group of diseases, i.e. “All the maladies you can cure by building a Ward.” Sometimes it’s more advanced treatment facilities, like the Colourizer for Grey Anatomy. These rooms cost more, require more staff, and take up a lot of space. Later on, a new hospital usually means new high-level mechanics, like research labs or staff training facilities, or even environmental concerns. Snowbound hospitals demand radiators for instance, or both patients and staff will freeze. As soon as you get comfortable Two Point Hospital wants to whisk you away though. You only need to get one star (out of a possible three) to move on—a process that usually takes 30 to 40 minutes at most. Not enough time to relax, and I wish Two Point Hospital were either reined in a bit or more deliberate with its pacing. 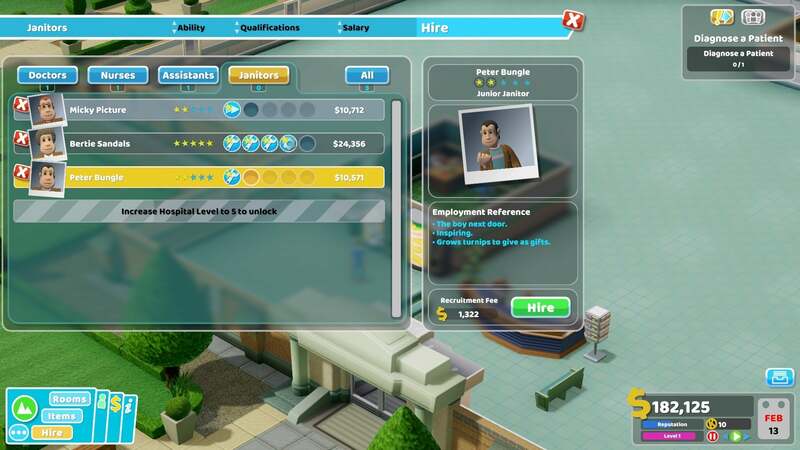 What I really want is to build one great hospital, not a dozen half-assed ones, but the way it doles out rewards and new mechanics, the game almost demands you keep moving. It’s doubly annoying because of the blank-slate nature of subsequent hospitals. You end up retreading a lot of ground before getting into the new stuff. Every hospital needs a reception area, a pharmacy, a general practitioner’s office, and so on. It’s always on you to build these out for some reason, plus staff them. All the groundwork, basically. 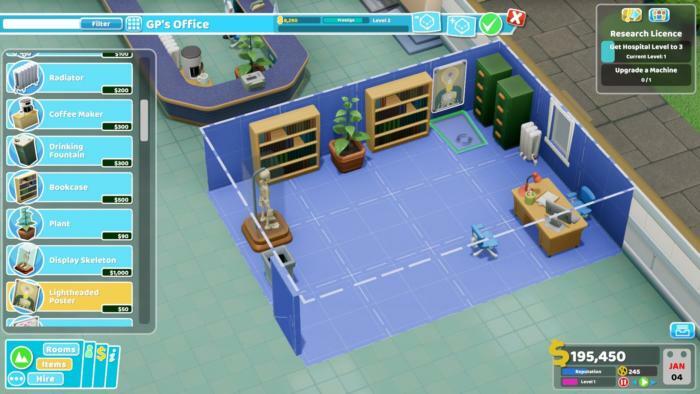 New items occasionally shake up the experience, and I found myself getting more efficient at it over time, but it’s unnecessarily tedious—especially since most of the early hospitals have more empty space than you’ll ever need in order to meet their objectives. “Why can’t I just stay here?” I found myself asking. It’s just a small structural complaint though, and I mean really small, mostly because I’ve enjoyed building up my hospitals. 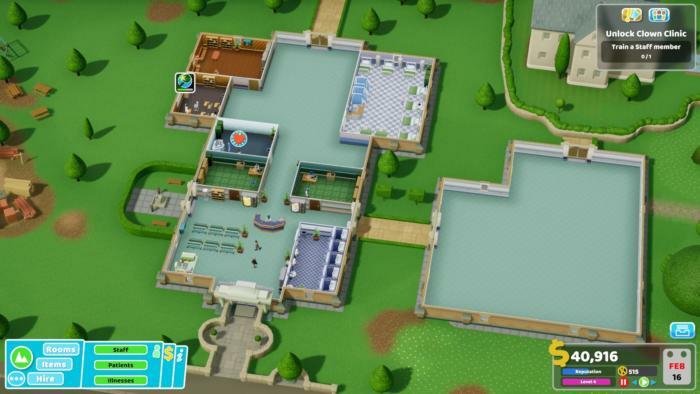 Two Point Hospital is the anti-Sims, really. The Sims is all about creating your dream home. Pick out the perfect carpet, the perfect windows and light fixtures. Put a granite countertop in your kitchen. Buy the piano you’ve always wanted. It’s interior-design-as-fantasy. 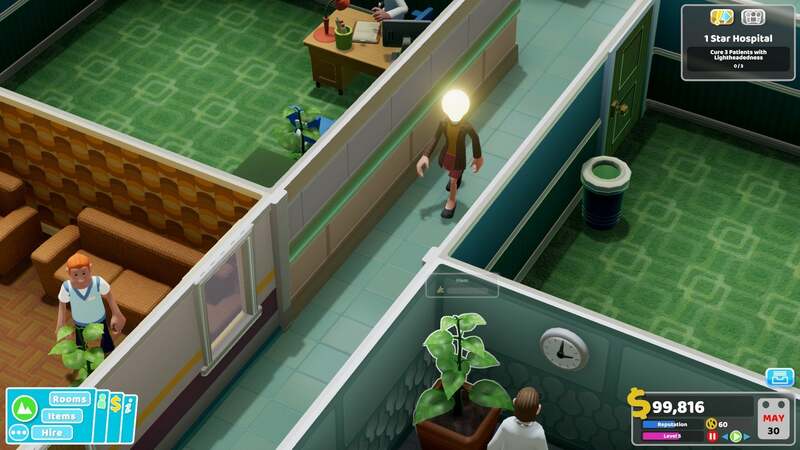 But Two Point Hospital is grounded in the mundane, relying on the shared visual language of the ur-hospital—the green tiling, dingy off-white walls, harsh fluorescent lights, plastic benches and vinyl counter tops, degrees from such-and-such institution in every office. It’s the worst possible environment for a builder-type game, sterile and function-over-form to a fault. It’s fascinating to me, and I’ve spent hours placing bookshelves and clocks and ugly brown couches, each time trying to nail the hospital aesthetic. It doesn’t quite justify the repetition, but it does mitigate it somewhat. It’s tough, following up a beloved classic with a modern successor. Few games manage, and even those who succeed usually can’t overcome the rose-tinted glasses that come with 20-plus years of nostalgia. But I think Two Point Hospital pulls it off. The groundwork was definitely laid by Theme Hospital, but Two Point Hospital evolves and expands upon nearly every facet of the original, wedding a superb management sim and builder to a charming and often-hilarious setting. It also plays a hell of a lot better than Theme Hospital in 2018, with a modernized interface and a fully-3D camera—useful when you want to get up close and personal with a patient’s monobrow. And you know you want to.